Powers: Asmodeus possesses powers to be expected of a minor player in the lords of Hell. He leads an army of demon-servants, who do his bidding. He also rules the lost souls who have entered his realm of Hell. He can project blasts of mystic energy and has a limited ability to manipulate the minds of others. He can drain energy from others. He is immune to disease and aging. While he has definite power, he can be injured by the power of other demons, such as Zarathos, and he is certainly no comparison for the power of Mephisto. (Marvel Zombies: The Book of Angels, Demons & Various Monstrosities - Asmodeus) - Asmodeus was originally an angel who joined Lucifer's rebellion against God. He was cast out of Heaven like Lucifer's other allies and degenerated into a demon. He eventually mated with fellow cast-out Lilith, parenting many demonic offspring though most were slain by agents of Heaven. (X-Factor I#251 (fb) ) - For centuries Asmodeus waged war with the other Hell-lords to become the sole ruler of all Hell domains. (Official Handbook of the Marvel Universe: Horror 2005 - Lilith) - In the 13th century, Joseph della Reina thought to summon the Messiah by confronting Lilith and her latest demon consort, Ashmodei (Asmodeus); no match for Lilith, Reina was transformed into a dog. (Ghost Rider II#53) - Asmodeus sought to make a pawn of the Ghost Rider/Zarathos in his intended campaign of terror against the Earth. To this end, he sent Tabicantra to manipulate him so that Asmodeus could enslave him. However, Tabicantra eventually turned against Asmodeus, who was forced to send V'Zarr-Than and several other demons to try to finish the job. Tabicantra sacrificed herself to destroy the demons, and Blaze was spared from his intended fate. (Ghost Rider II#64) - Asmodeus sent another of his minions, Rzh'Arr, to Earth in another plot against Ghost Rider involving his replacement of one of Blaze's friends, Cynthia Randolph. Rzh'Arr succeeded in weakening Blaze and bringing him to Asmodeus's realm. Asmodeus attempted to steal some of the power from Ghost Rider and make him his slave. However, the Ghost Rider burst free from his bonds and overpowered Asmodeus, causing him great pain with his hellfire. Asmodeus sent the Ghost Rider back to Earth rather than face further injury at his hands. (Ghost Rider II#76) - Asmodeus journeyed to Mephisto's realm and attempted to convince Mephisto to relinquish control of thr Ghost Rider/Zarathos to him. Mephisto saw through Asmodeus' plot to gain Zarathos as a tool in his desired conquest of Earth. Mephisto set up a contest which separated Blaze and Zarathos, and challenged them to make it through a gauntlet set up by Asmodeus. If they made it safely to the portal back to Earth, they would be freed from each other. If not, they would be trapped in Hell, and Zarathos would become a servant of Asmodeus. Mephisto decided to make things more interesting for Asmodeus by mentioning a small penalty if he failed to stop the two from escaping. Unfortunately for Asmodeus, Blaze and Zarathos cooperated and made it through the portal (although Mephisto's treachery left them still bound together). Mephisto administered his small penalty to Asmodeus, which consisted of blasting him out of existence. (Tomb of Dracula III#1) - Asmodeus once more took reign of Hell and ordered his minions to awaken from their decade-long slumber. Leathery wings once again slapped the coldness of night. Blood once more cut through the fragile veil of flesh to bring life to those things undead. But the night was still without its lord. Asmodeus reached for those sun-bleached bones where they last lay, but could find nothing save the crippled remains of some insignificant mortal. Thus began the search. One year more passed before was found the black soul that had long ago been skewered by silver. Asmodeus smiled (and somewhere in China an earthquake killed ten thousand) and returned the bones to their proper resting place. All was now where it should be. The rest would unfold in proper order. With information derived when Rachel, Marlene, and Frank Drake, Smirnoff traveled to Castle Dracula and resurrected the Vampire Lord by removing the silver spoke. As Dracula left with Smirnoff, he attempted to summon his legions (normally rats, bats, wolves, etc.). His powers "touched the loins of Asmodeus." A vast army of demon creatures, and possibly undead people, appeared to terrorize Drake and Marlene. Later, the Belonging's collective rituals resulted in over 1600 members being consumed in flame and the power of their souls being granted to Dracula. Dracula eventually tried to absorb the full power of the mass of souls, and was blown to pieces as a result. (Deadpool Team-Up#892 (fb) ) - Satana lost her soul to Asmodeus, Belasco, Dormammu and Mephisto (all four were posing as humans at this point) in a game of dice. Afterward they quarrelled about who would get her to gain control over Hell (she is heir to Marduk Kurios' part of Hell after all). (Deadpool Team-Up#892) - Satana hired Deadpool to get back her soul from the demons. After the demons revealed their true nature to Deadpool they beat him up. Satana married Deadpool so he could lay claim to her soul. Asmodeus ultimately won the right to marry Satana in another game of dice with the other three demons. Satana and Deadpool entered Asmodeus' domain, surprising him with their marriage. Asmodeus fought Deadpool to reclaim the right to Satana, but was sliced in half by Deadpool's mystically empowered swords (thank you Satana). With her soul reclaimed from Asmodeus, Satana left Deadpool again (with their marriage annulled). (Journey Into Mystery I#627 (fb)) - Asmodeus attended the Devil's Advocacy to talk about the Serpent (Cul)'s actions on Earth. (X-Factor I#249) - The demonic Warders created a passage to the different Hell realms at the New York Botanical Garden in form of a volcano. They battled X-Factor, but before the volcano closed Asmodeus and the other Hell-Lords passed through to Earth. (X-Factor I#250) - The Hell-Lord teleported X-Factor, Jezebel, Strong Guy and Tier to the Devil's Tower in Wyoming. Surrounding X-Factor they were determined to kill Tier and finally end their war. (X-Factor I#251) - Still surrounded by Asmodeus and the other Hell-lords X-Factor were protected by Layla's force field. When Pluto destroyed the force field the Hell-lords went after Tier immediately, but Madrox managed to nearly escape with Tier. Asmodeus and the other Hell-lords were shocked when Jezebel stabbed her father Mephisto in the back and teleported with X-Factor and Tier back to their destroyed HQ. (X-Factor I#252) - From afar Asmodeus, Satannish, Mephisto, Satana and Hela watched Pluto fight X-Factor and get killed by Tier. They were shocked that the legend was true that the seventh billion person walking Earth could kill them on Earth. Asmodeus commented that Pluto's participation in the contest was now over and that Pluto had to watch from the sidelines. Because nothing was going according to plan Mephisto attacked the other Hell-lords to start the final war among them. (X-Factor I#254) - In a snowstorm, surrounded by their armies Asmodeus and Hela battled (wherever they were at that point). Asmodeus believed Hela to be defeated and stabbed her body after knocking her to the ground, but it was merely an illusion and he got cut in half moments later by Hela, who mocked him for falling for such a trick. Hela then fell for an illusion as well and was slain by Mephisto. (X-Factor I#256) - Aided by Jezebel X-Factor secretly entered Mephisto's domicile on Earth. Tier slew the Hell-lords Satannish, Asmodeus, Hela and Pluto in the room where Mephisto had kept them imprisoned without mercy. Upon their deaths they all returned to their respective portion of Hell. When Satana arrived to offer the Hell-lords to pledge their allegiance to Mephisto and aid him against X-Factor she found their corpses and was slain by Tier as well. Comments: Created by Michael Fleisher and Donald Perlin. He was called Azmodeus in his first two appearances, and then Asmodeus in the last one. The OHotMU I Appendix refers to him as Asmodeus. Any demon can come back any time. How many times has Mephisto been "destroyed"? For my money, I like to think Asmodeus is now Azmodeus, the servant of Master Pandemonium. Asmodeus is not seen on a single page of the limited series, but his activities are mentioned in narrative throughout, and it would seem as if he were the behind-the-scenes manipulater of all of the supernatural events seen in this series. His demons are seen on-panel. There are a number of extremely vague and ambiguous statements in this series, and so I have done my best (after reviewing Dracula's full continuity for his profile, and reading through this series for the third time) to attempt to clarify what they mean. The only definitive actions of Asmodeus are the participation in the resurrection of Dracula (as quoted above) and the release of a bunch of demons to assist Dracula again Frank Drake. This story, with Asmodeus gaining control of Hell (or a realm of it anyway), would likely seem to fit in at some point after Mephisto might have been temporarily destroyed, such as in Fantastic Four I#277 (at the hands of Franklin Richards) or in Silver Surfer III#100. However, as this might represent one of myriad realms of Hell, this placement is not critical. More critical is how the resurrection of Dracula fits in. When Asmodeus searched for the bones of Dracula, he looked at Castle Dracula, where the vampire lord had been destroyed by Quincy Harker in Tomb of Dracula I#70. Dracula was not there, because he had been since resurrected by Florence Embers in Tomb of Dracula II#1. Asmodeus could not find Dracula anywhere on Earth. This is because Dracula had been destroyed by the Montesi Formula in Dr. Strange II#62. After some searching, he eventually located the soul of Dracula, perhaps because in Dr. Strange III#18, Marie LaVeau invoked a spell to recreate the Lord of the Vampires. This spell apparently disrupted the Montesi Formula, which--in its full form--had made it impossible for any vampire to exist on Earth. The effects on Varnae possibly may have carried over to other Lords of the Vampires, or at least Dracula, who is the only one to have held that title for any significant length of time besides Varnae himself. Asmodeus--as can be seen by the clarifications below--is a pretty popular demon name, apparently just under Satan, Lucifer, and what-not. So it may be that a bunch of demons have taken that name, to capitalize on it, or it may be that a single demon has taken multiple forms and motivations and power levels, or all of the above. Take your pick. Moot point. Dorcas Farkas. At any rate, a demon striving for this name wold likely seem to be one of the Class Two demons, along the lines of Mephisto, Thog, etc. These beings appear to originate from Earth, but from a much later time period than the Class One demons, the Elder Gods. This story was written under the Epic Comics imprint, and so is not inherently part of Earth-616 continuity. However, as discussed under the Dracula and Smirnoff profiles, they fit in pretty well and even explain some otherwise unexplained gaps in continuity. I placed the interference of Heaven in the war between the Hell-lords after Hellcat in Satannish's profile for various reasons. One reason was Satana's presence in the flashback, which made it impossible to have happened before the modern era. Another reason was that after the Hellcat mini the Hell-lords preferred to sit at tables and talk rather than wage war against each other. For Asmodeus this doesn't mean much because he was pretty much not at the top of the food chain at that point in time. Maybe he wasn't even present. In Marvel Zombies: The Book of Angels, Demons & Other Monstrosities the Ghost Rider foe Asmodeus was revealed to be the same as Asmodeus, the unseen demon connected to the Belonging from Tomb of Dracula III. You want to talk evil? Asmodeus has been seen in a thong! That's not right! 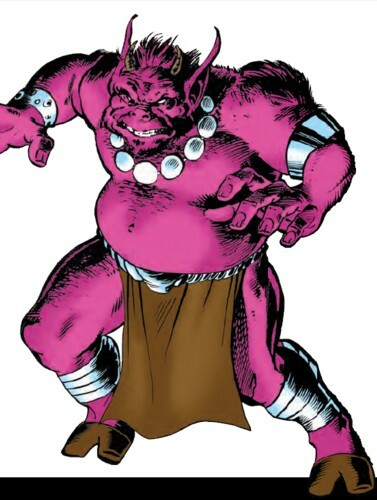 Azmodeus, the bird-like demon-servant of Master Pandemonium, @ West Coast Avengers II#4...although, if I could pick one, I'd make Mephisto's punishment of Asmodeus to have become this guy, who was forced to serve a mortal.